This really is my version of the Background Dress or the Second Look Dress. It's a black fitted dress. 3/4-length sleeves. 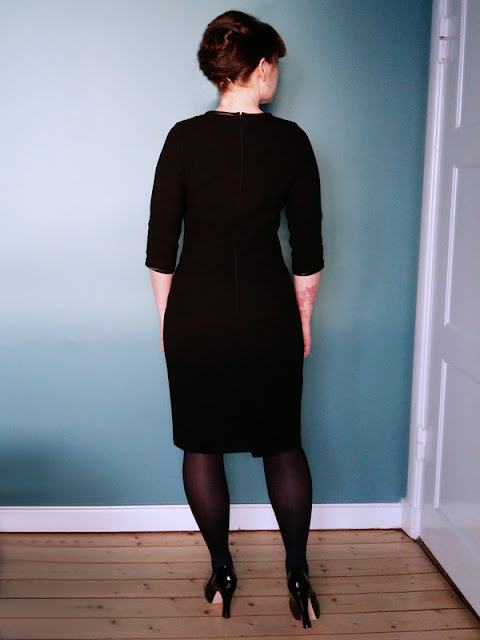 High neckline in front and in the back. A simple vent. The only embellishment is the bound edges of sleeves and neckline. And I felt like a million dollars wearing it! 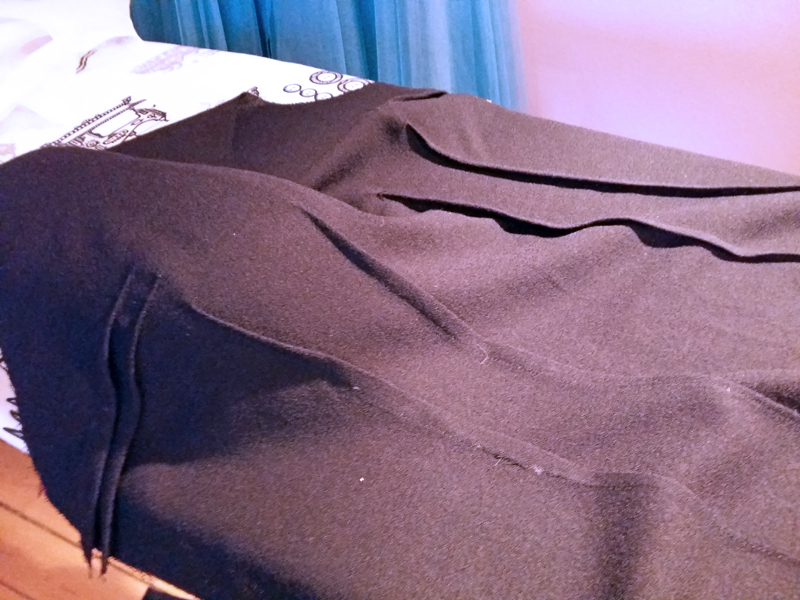 As I said, I continued my work on my Ultimate Dress Pattern. I changed the two front darts to four, and continued with split bust darts. I didn't make a toile this time but used the sky blue dress to estimate the fit, changed the pattern, cut the wool, basted all 12 darts (or 16 really - two on the shoulder, two on the sleeves as well) and pinned the rest of the dress - side seams, centre back, shoulders, sleeves... - and tried it on. It was so good! A little less fabric over the hips, but most changes were needed on the sleeves and armscye - I removed almost all of the ease from the sleeves which surprisingly gave not only really nice fitted sleeves but also more arm movement. I'm a rather bright girl, but sometimes I just don't understand fitting. Oh and the fabric! It's one of my most recent buys, from Lisbon. 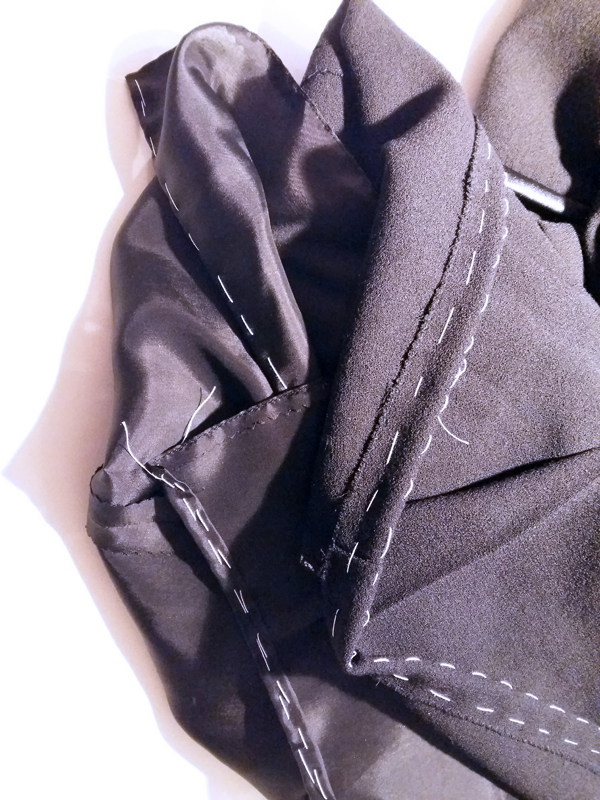 A black wool crêpe, and lined with my favourite mix of acetate and cupro. It's so nice to work with and so nice to wear. The satin bias binding is in rayon. Centre back is stabilised with twill tape and the zipper is prick stitched by hand. I used a new-to-me technique that I really loved (except that I did it by hand and without drawing on the right side of the fabric) and will be doing a lot more in the future. Since the crêpe isn't the most stable of fabrics, I used twill tape for the shoulder seams as well, and rayon tape when I put in the sleeves. (Why rayon instead of twill tape? Because there's absolutely no give in the twill tape, but there are some in the rayon tape and I want some movement in the sleeve.) After I sewn all the darts I thought about underlining. 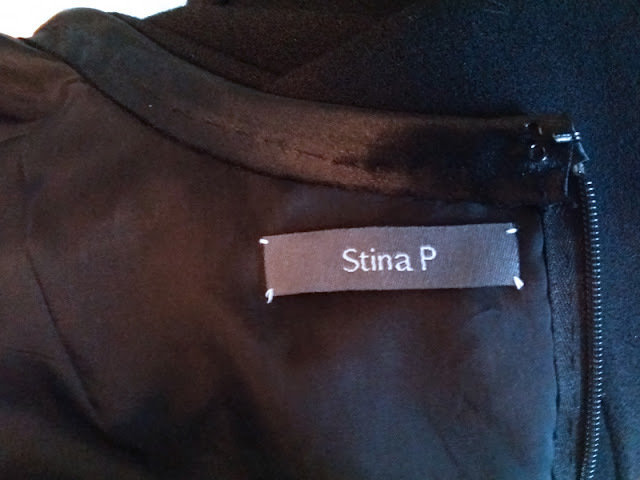 Should I have underlined the entire dress in the acetate-cupro instead? Or with silk organza and then lined it as usual? Time will tell! 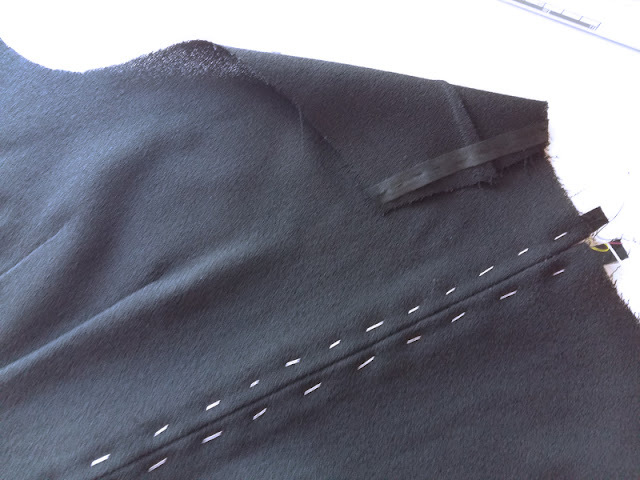 I cut the neckline and sleeves without seam allowances and bound the edges with bias binding - first one seam by machine and then I prick stitched by hand in the ditch, enclosing both the wool and the lining. 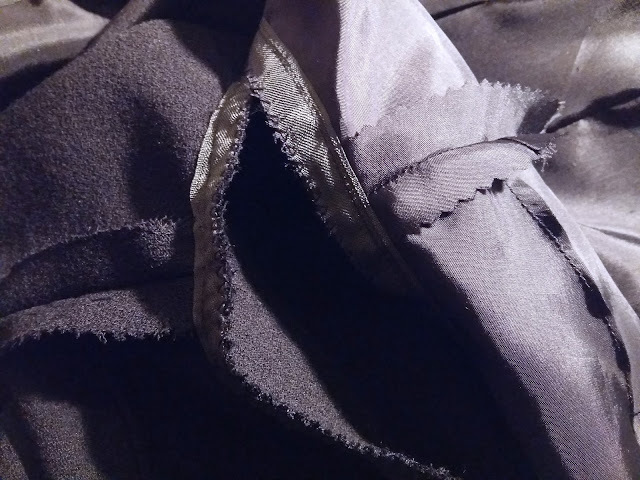 The lining is fell stitched to the centre back seam. I could wear this dress more or less every day. Love it. I like the classic and elegant Look. And the fit is perfekt, great Dress. I can see why you feel like a million dollars in that dress...it's because you look like a million dollars! Gorgeous and classy. Beautiful job. You're so kind - a million thanks! Lovely work and a very classic style. It looks wonderful and so flattering on you. Thanks for sharing. Thanks - and thanks for reading! As usual, I think this is gorgeous! The fit and finish are amazing. I'm so in awe. And as usual, you're so kind - thank you! Excellent! So elegant, so feminine, so different. Congratulations on a simple, but so very beautiful and outstanding dress. Thank you so much for your kind words, Marija! What do you think is the best cheap flower girl dresses to wear for a woman at a party? Here is a look at what women need to think of before choosing their party dress.